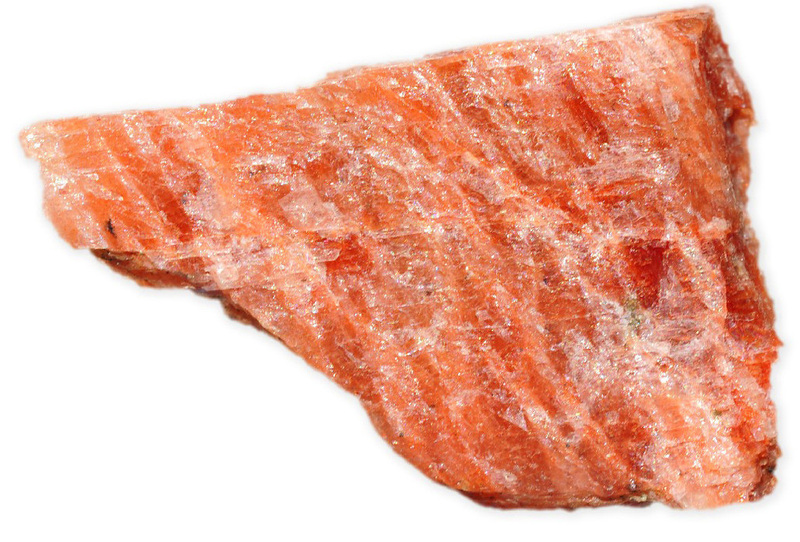 Feldspar gets its name from the German word "Feldspath" and related to the German word for rock. 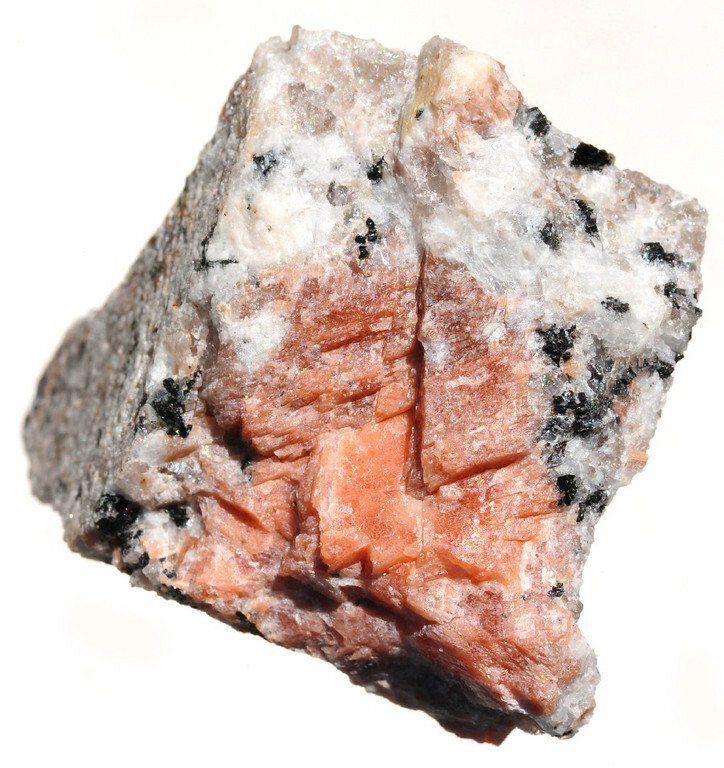 Feldspar, sometimes written as felspar, is the name for a group of silicate minerals that makes up the greatest percentage (almost 60%) of minerals found in the Earth's surface (in fact, if the entire composition of the earth's crust were regarded as a single mineral, it would calculate out almost exactly as feldspar). The feldspars are complex aluminosilicate minerals containing K, Na, and Ca, with some rarer types rich in Ba. The feldspars group members are all closely allied in form and habit due to a similar structure. 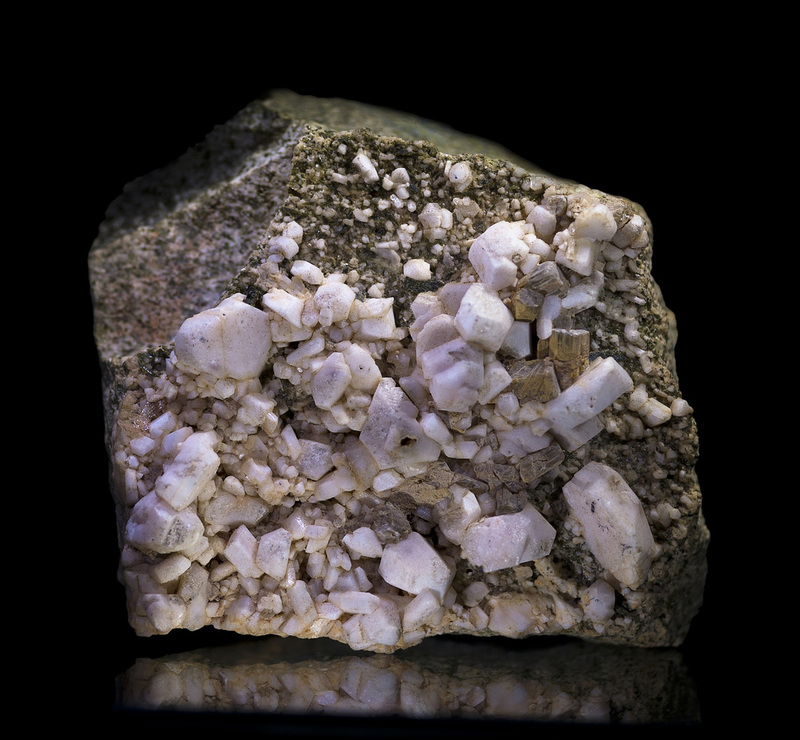 The feldspar group is divided into two distinct varietis: (1) the orthoclase or alkali which is rich in potassium and sodium (alkali elements), moonstone, orthoclase, and amazonite are the main members of this group; (2) the plagioclase feldspars (also known as soda-lime feldspars) that constitute an isomorphous series between albite, the sodium aluminium silicate, NaAlSi3O8, and anorthite, the calcium aluminium silicate, CaAl2Si2O8. Labradorite and aventurine are the main members of this group. Microcline is named after Greek words meaning "small and inclined" because the cleavage is close to but not quite 90 degrees. Its color ranges from colorless, white, pink, yellow, red, gray or green to blue green. The latter color is popular in gemstone circles, and the blue-green variety known as amazonite is widely cut into cabochons, beads, and carving. Orthoclase is from Greek words meaning "break straight" because the cleavages are at 90 degrees. Its color ranges from colorless, white, gray, yellow, reddish and greenish. 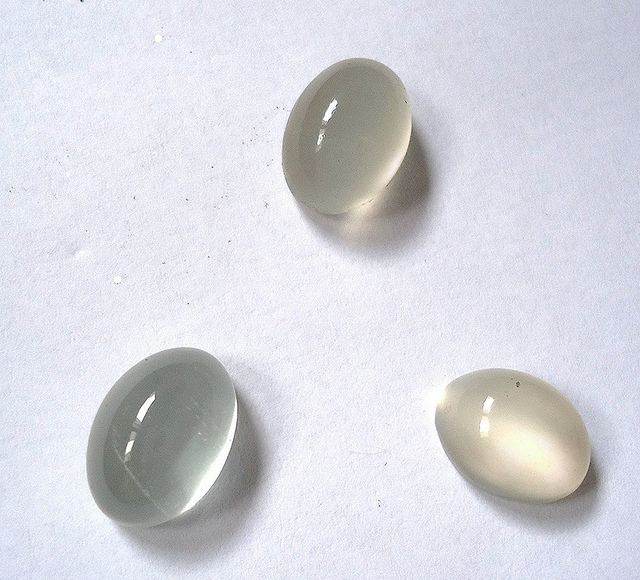 Orthoclase can have catseye effect. Yello and colorless catseye gemstones are known from Burma and Ceylon. Some of these (Ceylon) are also asteriated. Yellow faceted Orthoclase is a attractive and beautiful gemstone. Unfortunately, the cleavage makes it less advantageous for wear. 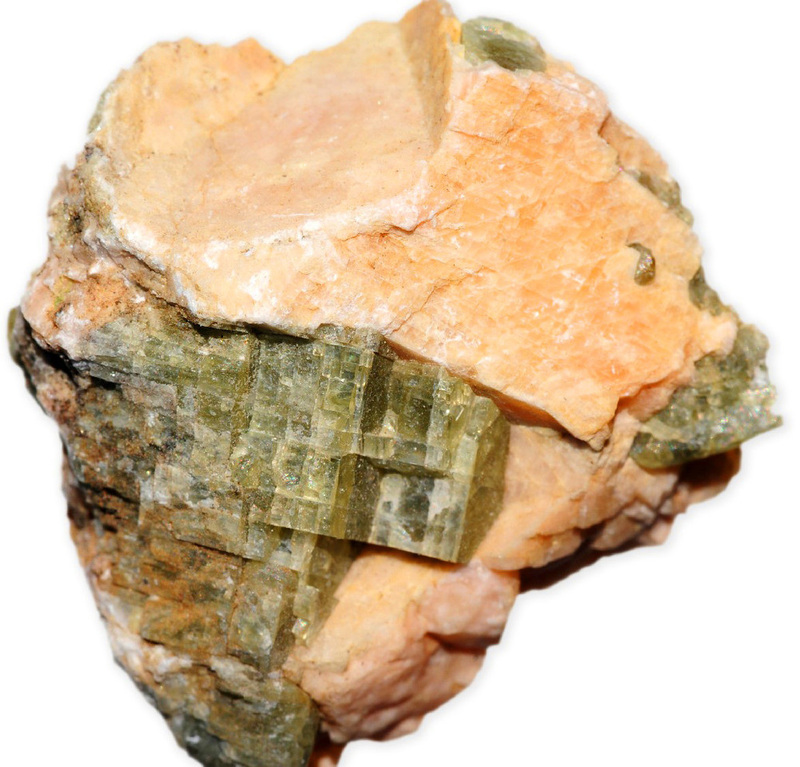 Sanidine gets its name from the Greek word, sanis, meaning board, in reference to the tabular crystals. Its color ranges from colorless to pinkish or brownish. 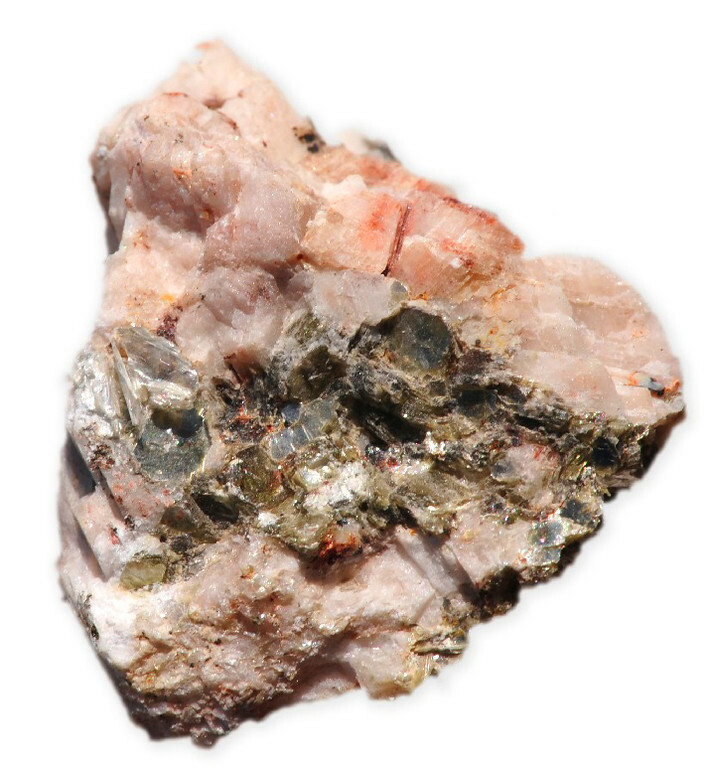 Sanidine is not a common mineral, and is hardly ever seen as a gemstone. Crystals tend to be colorless and nondescript, and are rare in cuttable sizes. 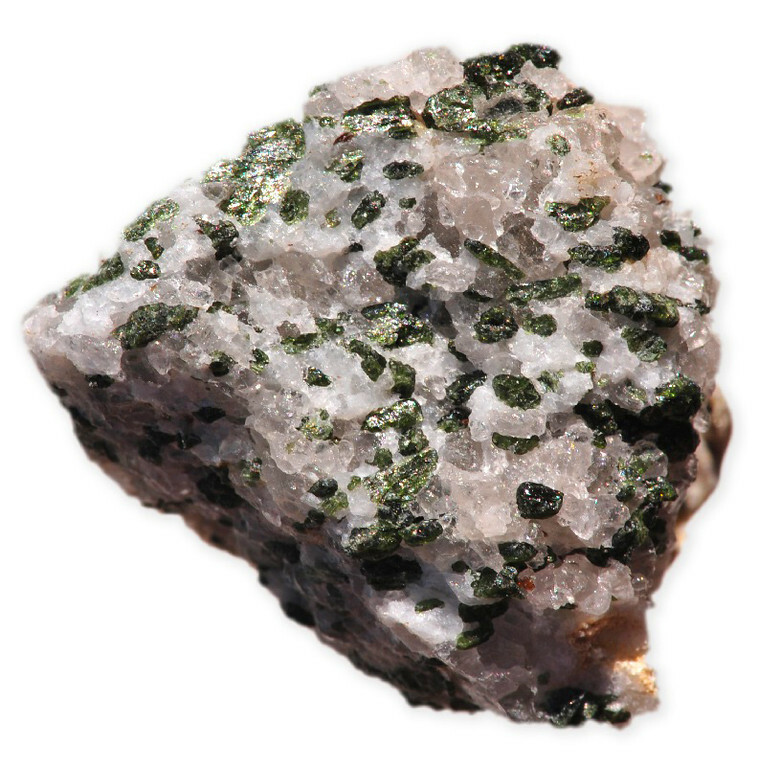 Sanidine is a mineral of volcanic rocks, with little gem significance. Perthite is named for the locality, Perth, Ontario, Canada. Perthite is an intergrowth of albite, oligoclase, plus orthoclase or microcline. It should be noted that fine perthite that is suitable for cutting comes from Dungannon Twp., Ontarion in large pieces, as well as from various locations in Quebec, and from other countries. Albite name comes from the Latin albus, meaning white, because the mineral is usually white. Other colors include, yellow, pink, gray, reddish, greenish and colorless. Albite is sometimes intergrown with emerald, especially in the strange hexagonal skeletal crystals known as trapiche emerald. Small faceted gems are fairly rare. Albite gems are colorless in most cases, and not exciting to look at. Read more about labradorite here. These Feldspars are rarely encountered in gem form. Their occurrence is widespread throughout the world, in a great variety of rock types and environments. But in most cases transparent crystals are rare. 1- The Jeweler's Directory of Gemstones, Judith Crowe, Firefly Books, 2012. 2- Color Encyclopedia of Gemstones, Joel E. Arem, VNR publications, New York.